Remember our coffee maker trials in February? After lots of research, including checking out what Cook's Illustrated had to say about it, we decided to go with the French Press option for a new coffeemaker. Surprisingly (for us), it's low-tech. It involves heating water in the kettle, pouring it over the grounds, straining it with the press, and enjoying it. While it's still piping hot. 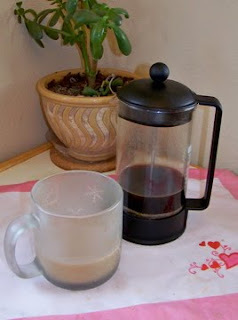 At the time I purchased the Press, I also bought an electric coffeemaker "just in case." A month later, I took it back because this meets all the need we have at the moment. Plus the kettle whistles when the water is hot, and the electric one just can't compete with that. My favorite part about the French Press is that it demonstrates the principle of having the right tool for the job. In which I have the right tool, and someone else does the job. Oh yeah! Since beginning to work from home, the Captain has become my personal barista. During his six-day absence last week I finally had to make coffee for myself again; I did okay, but gladly gave it up upon his return. Some things just taste better when someone else makes them.